Kizomba is a relatively newly developed dance style; it originated in Angola in the 1980’s and since then has spread across the globe, taking the dance clubs of the world by storm. Both the dance and music have their origins in Semba, Kilapanda and Angolan Merengue. The word Kizomba is actually derived from the Angolan word for ‘party’ or ‘celebration’. The dance is known for its smooth, earthy dynamic and traditionally close partnership hold, lead mainly with the torso. The steps are remarkably simple and are danced on every beat. Kizomba’s magic (and the reason for its wide-spread popularity) lies in its relationship to the music, and the finely tuned lead-follow connection that it demands. There are more or less no rules concerning step patterns; instead, musicality takes precedence. Dancers must listen, and interpret the music through their movements. 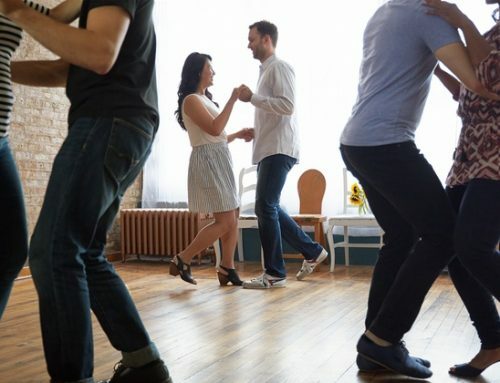 Even though Kizomba is traditionally danced with torsos touching, it can also be danced in a slightly more open hold, depending on the preference of the dancers. So, don’t be put off by the intimacy that the dance portrays. As with all social dances, respect and courtesy are of paramount importance; you need only dance as close as feels comfortable for you. The style of Kizomba that is most commonly taught in the UK is Urban Kizomba, or “Urban Kiz”. This is a modern, hybrid style which combines the traditional feel of Angolan Kizomba with stylistic qualities from a variety of other genres, such as Hip-Hop and Argentine Tango. This sub-style appears more upright, and is usually danced on linear pathways, often with more distance between the dancers’ bodies. Syncopation’s are used more frequently as well as the usual ‘on tempo’ steps. Urban kiz also draws inspiration from Kizomba’s cousin, Tarraxinha, which is danced more or less on the spot and is characterized by subtle, sensual isolations and responsive body-to-body movement. Another appeal of Urban Kiz is that it can be danced to a really wide variety of music. Most Latin dance clubs play Kizomba remixes of popular RnB, Hip-Hop and chart music, as well as more traditional Kizomba music built around African folk rhythms. Consequently, Kizomba is a great dance style to have under your belt – as you can find frequent opportunities to put your skills into practise!